The Sauvie Island Fire District, a rural fire protection district, was established in the 1980s after a devastating fire burned down the school. The District serves all of Sauvie Island and provides mutual aid to Portland Fire & Rescue and Scappoose Rural Fire Protection District. Our volunteers are dedicated men and women who go through the same training and certification as career firefighters and emergency medical service personnel. 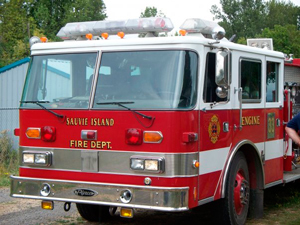 Sauvie Island Fire District has a main station and two satellite stations where additional apparatus are located. Our firefighting apparatus includes: three engines, two tenders, and a brush unit. In 2012, we added a medical squad to our fleet. If you or anyone you know are looking for a way to serve your community, please consider joining us. We offer full training for all men and women interested in becoming a firefighter and/or emergency medical personnel. Volunteer opportunities are also available for non-firefighting and youth programs. Some examples of non-firefighting opportunities would be clerical, social media management, tender driver, grant writing, and firefighter relief station coordinator. Youth opportunities are available through our Cadet program for ages 13 – 17. The cadet firefighter program gives young people the chance to learn about local fire, rescue, and emergency medical services response organizations in a safe controlled environment. Contact us for more information on how you can join, or stop by the Station on one of our training drills held on Wednesdays at 7pm.